Is your Soil getting tired? 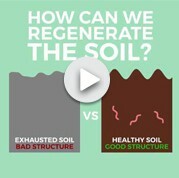 Globally, soils are being used to their limits and beyond resulting in reduced performance of soils. For example, plowing too deeply, excess Nitrogen use and reduced return of Organic Matter to soil degrades soils over time. Farmers notice these tired soils by the reduced Yield and Quality of their crops. Tradecorp´s solution, Turbo Root acts as a complete soil conditioner to improve the soil. Turbo Root is composed of Humic and Fulvic Acids, Free Amino Acids and a complete suite of Macro and EDTA Micro nutrients. This helps revive the Soil by improving structure and nutrient status. This stimulates both the microbes in the soil and also the plant´s metabolism. Turbo Root´s unique formula for your tired soil, not only helps Soil properties it also reduces plant stress, promotes increased nutrient cycling and uptake, resulting in an improved harvest and profitability.